Few monuments of antiquity arouse as much fascination and awe as the massive limestone figure that reclines on the sands of the Giza Plateau. When Pharaoh Chephren ordered its construction during Egypt's 4th Dynasty, he sought an everlasting memorial to his divine reign. Among history's contenders for eternity, Chephren succeeded better than most. Sixty-six feet high (20 meters) and 240 feet (73 meters) long, the Great Sphinx has endured for 4,600 years as an icon of Egyptian civilization. Photo ca. 1890 taken by G. Légégian, reproduced courtest of Barry Iverson, Cairo. It has survived, but not without serious scars. Throughout its existenceand possibly at a greater rate in this centurythe carved monument has been slowly but relentlessly flaking away. Despite decades of study, knowledge of the forces responsible for the Sphinx's seemingly inexorable deterioration remains incomplete. What is certain is that without some mitigating measures, the physical integrity of this universally recognized symbol of our past will continue its decline. To address the complicated question of what should be done, the First International Symposium on the Great Sphinx was convened by His Honorable H.E. Farouk Hosni, Minister of Culture for Egypt. Held in Cairo between February 29 and March 3 of this year, the conference was attended by 90 invited Egyptian and foreign experts from a variety of disciplines. According to Mohamed Ibrahim Bakr, Chairman of the Egyptian Antiquities Organization (EAO), the EAO has received numerous suggestions in recent years for preserving the Sphinx. The function of the conference was to "provide the proper forum for objective assessments of offered methodologies" and to facilitate the exchange of information. Zahi Hawass, the EAO's Director for the Giza Plateau, stated that the conference was "the first time we've looked at how to protect the Sphinx with a long-term preservation plan. It's also the first time Egyptians have brought experts from all over the world to look at the history and conservation problems of a specific monument. The reason is that the Egyptians believe that the Sphinx belongs to people from all over the world." Twenty papers on a variety of subjects were presented. Topics included the geologic formations of the statue, the effects of meteorological and geophysical conditions, computer and photogrammetric documentation, computer and aerodynamic modeling, and preventive conservation measures. In addition to reviewing technical conservation problems of the Sphinx, the conference considered site management approaches for the entire Giza Plateau, a World Heritage Site southwest of Cairo. The Plateau is the location of not only the Sphinx but also the well-known pyramids of Cheops, Chephren, and Mycerinus, as well as number of other important archaeological finds from approximately 2,500 years of Egyptian history. Conference participants reviewed the history of the Sphinx's restoration, carried out since before Roman times, and discussed the monument's current treatments such as stone cladding of lower portions of the immense structure. Participants acknowledged that preservation efforts appear to have improved in recent years. Mark Lehner of the Oriental Institute of the University of Chicago has documented the Sphinx since 1979. Dr. Lehner presented his results and noted that "the architectural records of the Sphinx make it possible to construct a computer model of the current condition of the monument and its hypothesized condition during ancient times." Lehner believes that additional refinements to the model will be useful in future conservation studies. 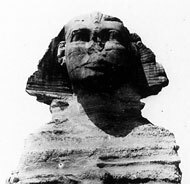 The limestone used in construction of the Sphinx varies greatly in durability. While the stone for the head and base is relatively hard, soft layers of limestone alternate with harder limestone in the body portion in between. It is here that the most serious deterioration can be seen. What remains unsettled is just how quickly this deterioration is occurring. Norbert Baer of the Conservation Center of New York University's Institute of Fine Arts believes that more documentation on the rate of erosion is needed to acquire a better understanding of the mechanisms of the monument's deterioration. The results of the recently completed, year-long environmental monitoring of the Sphinx, conducted by the GCI and the EAO, were presented by Frank Preusser, GCI Associate Director for Programs and Scientific Program Acting Director. The environmental study found greater than anticipated climate fluctuations around the Sphinx, particularly in terms of air temperature and relative humidity. It also found that winds at times achieved an unexpected velocity. The degree of fluctuation in humidity is relevant because of the composition of the limestone. The gypsum and sodium chloride contained within the rock absorb moisture and dissolve at higher levels of humidity. When the humidity drops below those levels, the water evaporates and these salts crystallize. The environmental monitoring study indicates that this humidity cycle is occurring nearly every day. Continual salt crystallization, which has a destructive effect on the stone, would explain at least some of the deterioration of the Sphinx. Certainly there are other possible sources of moisture at Giza besides humidity, such as rising ground water and rainfall. But the effect of these factors has yet to be quantified to the extent that has now been done with relative humidity. A number of different theories have been offered regarding the causes of the Sphinx's deterioration. Factors such as wind erosion, sand erosion, airborne salts, seismic activity, and vibrations due to vehicular traffic have been considered. Atmospheric pollutants, the consequence of the urban area adjacent to the Plateau, may also have an impact. Because subsurface data from the Sphinx could help quantify the importance of other factors, some symposium participants recommended that a depth profile of the Sphinx be conducted to see how deep the temperature and humidity fluctuations extend into the rock. There was also a discussion of controlled chemical consolidation experiments on the uncut rock adjacent to the Sphinx that contains the same geological strata as the monumental figure. At the conclusion of the conference, participants recommended that a multidisciplinary international committee be formed to study proposals for the protection of the Sphinx with a "view to formulating a unified, final, comprehensive master plan of action, ready for immediate implementation." The EAO has indicated it will establish such a committee. Dr. Hawass stated that future action will be determined by additional studies yet to be completed. "Plans for protecting the Sphinx should be based on evidence, not imagination. We will wait for more data and experiments and reconvene a second international symposium when there is more information to review," he said. "In the meantime there will be more deterioration studies including sampling to analyze the rock and a comprehensive study of the environment. And we will review new site management proposals for the Giza Plateau as early as October of this year." Clearly it is far too early to say whether the Sphinx's present rate of deterioration can be abated. Nevertheless, the fact that the monument is now formally an object of international inquiry suggests that more vigorous efforts will be made on its behalf. "The Sphinx's smile is beaming bigger after the conference," said Dr. Hawass.